On December 27, tankan trees at Ikemiyagi Farm in Izumi, Motobu Town. 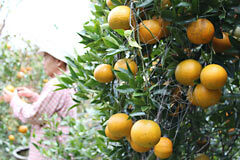 There are about 20 farms where you can pick tankan. The admission is 250 yen for elementary school children and older, and 200 yen for each child in a group of children. One kilogram of tankan costs 250 yen. Tomoharu Yohena, the president of the Izumi Tangerine Production Union, said, “The taste is good as ever. I hope that people enjoy picking tankan as well as looking at the cherry-blossoms.” For more information, call Mikan-no-sato at 0980 (47) 2889.